It is only eighteen months since Ambassador Dr Anne-Marie Schleich took up her post in Wellington in August 2012. Born in Saarlouis in Germany, she graduated from the University of Manheim where she obtained a PhD in Political Science. After graduating from the University of Mannheim, she studied under a Fulbright Scholarship at Mount Holyoke College and at Harvard in Massachusetts as well as at the University of North Carolina, a Research University located in Chapel Hill, North Carolina. From 1998 to 2001, Dr Schleich was a Foreign Affairs Adviser in the International Division of the Federal Chancellery in Bonn and Berlin. From 2001 to 2004, she was Head of the Division on International Environment and Bio-policy Issues in the German Foreign Office in Berlin and from 2004 to 2008 she was Head of the Culture and Education Division at the German Embassy in London. During this time, she held positions in the German Embassies in Singapore and Bangkok and headed the Trade and Commerce Section of the Embassy in Islamabad. From August 2008 until she came to New Zealand, Dr Schleich was the German Consul General in Melbourne. Dr Schleich is married to Mr Cheng Tan, a retired Barrister-at-law from Singapore, and they have two children. Marking 60 years of diplomatic relations with New Zealand, Germany’s Ambassador to NZ, Dr Anne-Marie Schleich, gave a presentation at Plimmerton Rotary on 11th March. Dr Schleich was generous in her comments about the quality of work being done by the Rotary Club, both in helping people locally and through its various international programmes such as Rotary Youth Exchange. The latter was all about promoting international peace and understanding, which had parallels with her own role as Ambassador. Following the reunification of Germany, the country’s land area was slightly larger than New Zealand’s, but whereas NZ had a population of 4.5 million, Germany’s was around 80 million with a GDP of over 2,500 Billion Euros. It was the world’s third largest economy and the biggest in Europe. Quoting some interesting statistics, Dr Schleich noted that Germany produced 1500 types of sausages, while its 1300 breweries brewed some 5000 different beers. The New Zealand–Germany Business Association was the largest European trade organisation in this country. Germany was now NZ’s 7th largest bilateral trade partner. Over 100 German firms were represented here, together employing some 10,000 New Zealanders. An example was the Draeger company which made specialist safety equipment for fire service personnel and others in hazardous occupations. In fact back in 1953 this firm had supplied equipment used by Sir Edmund Hillary and Sherpa Tensing during their conquest of Mount Everest. Another example was the Bauer Publishing company, which had recently taken a stake in NZ’s publishing industry. Over 200 German scientists have worked here with their NZ counterparts in recent years, in fields such as biotech, robotics and health, as well as assisting in the exploration of the Antarctic ice shelf. The latter programme provided a fascinating look at what Planet Earth was like many thousands of years ago. This was achieved by using specialist equipment made in Germany to drill as deep as 750 metres into the ice and then analysing samples of the various layers of ice, one layer for each year. Many thousands of young Germans continued to take advantage of the working visa and study visa programmes to spend time in NZ. Germans generally shared with New Zealanders a passion for sport and for the outdoors. Many Germans regarded New Zealand as a favoured tourist destination, with some 68,000 visiting each year. The average length of stay was a surprising 55 days. This contrasted with tourists visiting from China, where NZ hosted some 200,000 each year but their average length of stay was just 5 days. Regarding the European Union, the Ambassador noted that when the effect of the global financial crisis was felt in Europe, the majority of German citizens saw a need to support other members of the Union because the EU was a vital market for German goods. Most commentators were now picking modest but positive growth for the EU. Countries such as Ireland and Portugal no longer need financial support. Overall the economic outlook for the EU was encouraging. Next meeting – 18 March: Bowls at Whitby Bowling Club from 5pm. Committee Meetings after Bowls on 18 March 2014. 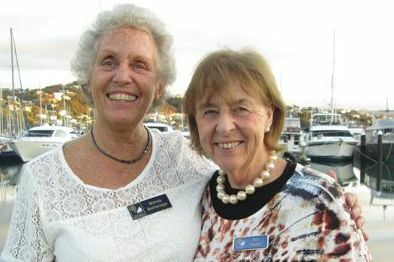 Sue Adams, introduced by Wendy Betteridge, joined Plimmerton Rotary on 11 March. Meeting of 1 April 2014 at Rotary Club of Tawa, Tawa Bowling Club, Davies St, Tawa. Working Bee at Ration Point on Saturday 15 March. Meet at the Nursery, Paekakariki Hill Road at 9.30am, then car pool to Horokiri Stream. Bring gloves, eye protection, kneelers, weeding tools. Host Families are needed for our next International Exchange Student. Contact Dianne McGavin – ph 237 7739. The 13 Bikers who successfully rode the Otago Rail Trail last week are in recovery mode. THE BOOK FAIR IS JUST 11 DAYS AWAY. SPREAD THE WORD. District Conference is the same weekend. There is LETS (Leader Elect Training seminar) on the Sunday for the in-coming Board. Ann Howick (Williams) attended the last Club meeting, while visiting from UK. 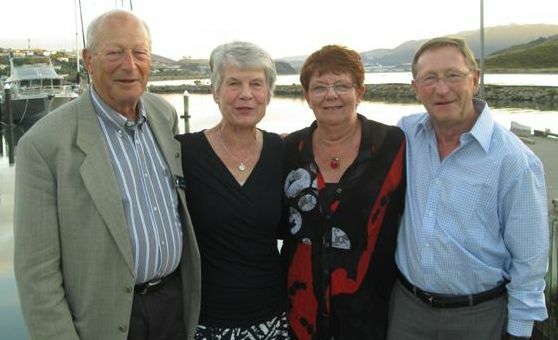 Pictured with Jim Dearsly and Allan & Barbara Nichols. Original generation time 1.3846 seconds. Cache Loaded in: 0.0372 seconds.